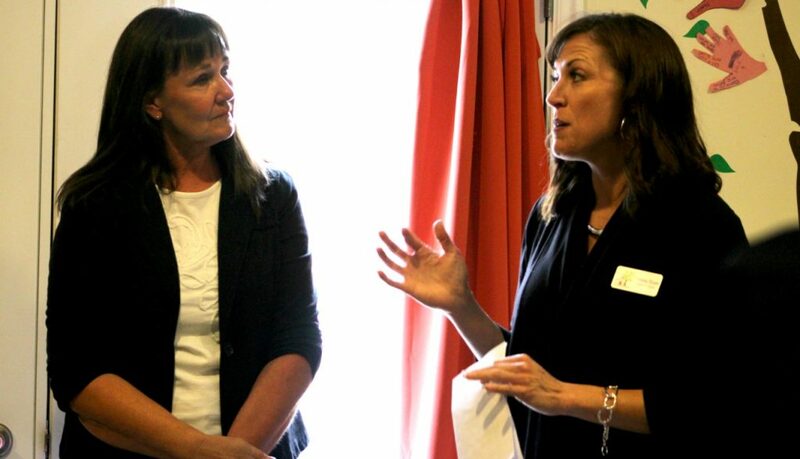 ST. GEORGE — Thanks to a grant from the Allstate Foundation, survivors of domestic violence will learn how to protect themselves from financial abuse with a program aimed at helping them gain financial independence. 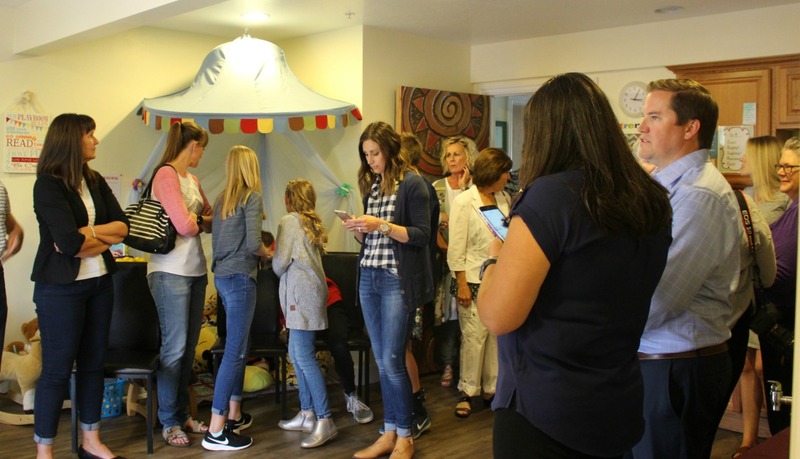 The Dove Center was presented with the check for $30,000 before a standing-room-only crowd of supporters at the facility’s annual awards ceremony held Wednesday at Erin’s House in St. George. The $30,000 presented at the event was an Allstate Foundation “Helping Hands” grant that was awarded to Dove Center based on the volunteerism of 30 agency owners statewide. 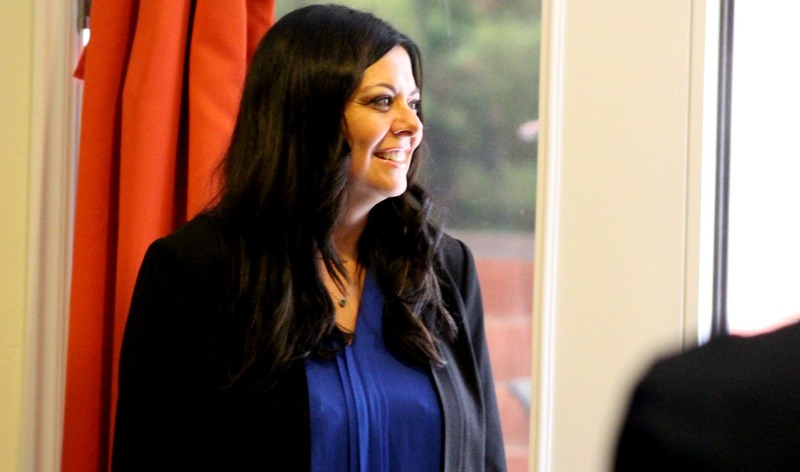 Devastation can result when a victim of domestic violence has to leave a home, income and economic benefits to escape abuse, Dove board member and Allstate agency owner Shonie Christensen said. “The number one reason victims stay, or return to the home, is because they don’t have the financial resources to break free,” Christensen said. According to the Allstate Foundation, one in four women will experience domestic violence in her lifetime, which is more than the number of women diagnosed with breast cancer, ovarian cancer and lung cancer combined. Statistics also show that more than 3 million children across the nation witness domestic violence in their families each year. 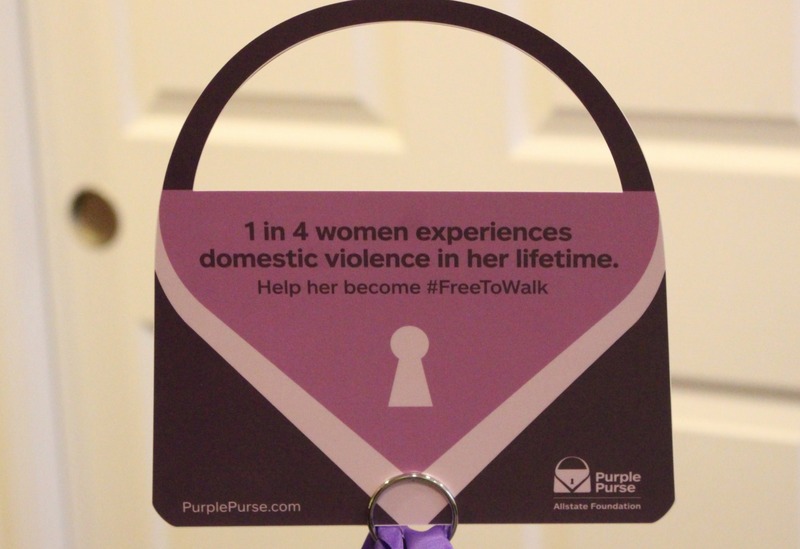 Allstate Foundation’s “Purple Purse” program helps domestic violence survivors prepare for the future by helping them better understand and manage their personal finances. “The ‘Purple Purse’ represents the purse which holds the woman’s credit cards, driver’s license, and identification – the very things needed to gain financial independence,” Christensen said. One purple purse was presented to Lori Burgess for doing “an exemplary job in our community,” Christensen said. Burgess has served in multiple positions on Dove Center’s Board of Trustees over the past six years and has been instrumental in furthering the growth of the program and maximizing resources that in turn expanded the program’s reach within the community, Lindsey Boyer, executive director at Dove Center, said. “I’m honored to be associated with these volunteers who spend countless hours and the staff who help these families who’s lives are in crisis – it takes an army to do this,” Burgess said. Boyer added that the services provided by Dove Center have changed over time. In the past, women were provided a safe shelter to go to with their children. Today, Boyer said, that “safe shelter” can mean assistance with protective orders, relocating to a safer home away from the community, support from other survivors and many other services for survivors not living in the shelter. “We may not know what these women who come to us need, but they do,” Boyer said. “That’s part of what this funding from Allstate helps us to accomplish,” she added. Across Utah, more than 30 Allstate agents, working through the Allstate Foundation, collected toiletry and bedding items to be donated to domestic violence shelters throughout the state. Local agents Christensen, Richard Harris, Greg Lund, Ryan Bishop and sales team leader Allison Williams participated in the shelter drives, which collected enough items to provide bedding and toiletries to 13 shelters throughout the state. “Every single Allstate agent in your community has served on the Dove Center board of directors and supports this cause,” Christensen said. Christensen serves on the 13-member board of trustees and also volunteers in events throughout the year, including the Gala event, one of the biggest fundraisers held annually. This year’s Gala hosted by Dove Center, raised more than $100,000, the most in the program’s history. Since 2005, Allstate has invested more than $50 million in grants and program funding to end domestic violence. That funding has played a part in helping nearly 800,000 survivors, training more then 8,600 service providers across more than 1,600 nonprofit organizations in the nation. Since 1952, the Allstate Foundation has invested more than $400 million in funding across the country to address key social issues and supports organizations dedicated to addressing two issues: domestic violence and youth empowerment. Editor’s note: The purpose of the $30,000 was amended to reflect a “Helping Hands” grant which can be used at the program’s discretion. Additionally, the number of shelters that benefited from the donated toiletries and bedding totaled 13, not 19 as announced during the presentation. What a strange story. Yes, credit checks are used for about everything nowadays. But really, with affordable rentals so scarce in this town why would you stay here if you’re looking to rent? And, to be fair, it isn’t anyone else fault you have bad credit, besides yourself, and maybe your loser abusive spouse? It sounds like Dove put you up for awhile, but you can’t stay there indefinitely, obviously. If you want good credit you have to pay your bills; that’s not their fault or the city’s. Bob, emotional and mental abuse is tough. It feels like there are chains on you and your powerless. Having said that, blaming the perpetrator is a part of the victims eyes being opened. Then the victim blames themself for allowing it to happen. Then the victim gets stronger and soon stands up and says, This Will Never Happen Again to Me! Its an emotional and mental war, Bob. Well, LBA, she’s blaming the dove center for a lot of problems related to her bad credit it seems. She seems to be throwing blame around a lot but not taking responsibility for her own actions, which is a very typical thing with millennial-age females. A lot of gals latch onto these loser abusive parasitic men, and a lot of us just can’t understand it. Rob83, do you really not have any relatives or friends you could stay with till you get a real divorce and separation? She keeps crawling back to her loser abusive parasite man, and like I said, I wonder if part of her doesn’t want to stay with this guy. If she’s got a pack of kids with this guy she may never do better than shacking up in the trailer park with her wife beater man. We get one side of the story, and it sounds like whining to me. Get it together, woman, if you want something better you’re going to have to make better decisions. But I do get it, LBA, a lot of women get emotionally dependent on these men even though they are total loser abusive man-child types. There’s not much logic or rationale to it. You’re right Bob, what you say is true. It takes toughness to get a women out of that state of mind. I didn’t see it as blaming, I saw it as another perspective to the article. That’s unfortunate Rob83. The first step is get your free copy of your credit report and one by one make a dispute on it. Otherwise, you can just let time go by until it all drops off. As for living with your abuser, I cant help but think that person helped you get bad credit. I dont know the truth tho. Lastly, blink twice if you need us to call 911. Ladybug you’re awesome. Yes, I had good credit until I married him and he forced me to sale both my vehicles that I had paid off for low-ball price. He helped me max my credit cards, pUT phone in my name, and utilities and to not pay a dime to any of them. I wasn’t blaming any one for my predicament, I know I made my choices. My point was the Dove center claims it can help us victims get a fresh start, but when we are financially abused? Nothing can be done? I would like to see some stats of success rates, if possible. Not just have the town assume these victims are actually succeeding in escaping their abusers or are they mainly just returning to them? Some of you ladies are real good at finding some real gems. You must’ve fallen head over heels. What was it? Was it a leather jacket and a harley? Was it a big lifted diesel truck? When I hear these sorts of stories most of the time there is a part of the woman that still loves the guy deeply and doesn’t actually even want to break it off. I’ve actually learned a lot about female psychology over the years and you probably thought you’d found an alpha dog–a real keeper. In the end just another loud mouth drunkard wife beater. If you really want to leave you’ll find a way. If there’s a custody sharing arrangement that obviously makes it a lot more complicated. Step up and take responsibility. It was your decisions that got you where you are. Be a big girl and stop blaming everyone else for your problems. It’s called awareness not just turn a blind eye because you can’t comprehend abuse in its many forms. I’m sure there are many who possibly take advantage of these free services some how. I was there twice, sincerely trying to escape him all to find myself back with him because I couldn’t get my own place, boy am I lucky he’d take me back! Don’t think I haven’t heard ” we’ll he must not be that bad?”. Um…yes he is! That’s why I’m grateful I know my Savior, he saves me everyday! Lucky for me it’s mostly just verbal, emotional, financial abuse. It had been at a scary point physically at a few times, but I’ve learned how to walk on egg shells really well. Aside from him telling me to kill myself everyday, I’d say we’re doing pretty good now! You need to get out of that situation. What about your friends? Can’t you stay with them until you can get on your feet? Yea I know that you’d have to sleep on a couch for a few weeks but Im sure you can find someone who would be more than willing to rent you a room for cheap, with no credit check once you’ve got some cash in your pocket.